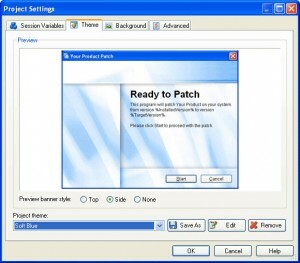 Visual Patch is the fastest way to create compact and secure patches for your software applications and data. Visual Patch’s point and click design takes the difficulty out of building even the most sophisticated patches. Other tools can stall out on files as small as 40 MB. Visual Patch can make quick work of gigabyte sized files. State-of-the-art DeltaMAX binary differencing compression creates the smallest possible patch files in less time than ever before. Update any previous version of your software to the latest release with one patch file. Dramatically simplifies the patching process for users. Intelligent full-history patching algorithms can update multiple older versions to the latest release from a single patch file. Patches can back up any modified files and automatically ‘roll back’ to the originals if an error occurs or a user aborts the patching process. Quickly and easily add, remove and organize all your product versions using the drag and drop workspace. Makes it easy to manage all your software releases from one environment. Walks you through the creation of a professional software patch complete with customized dialogs, multiple methods of version detection and rollback. 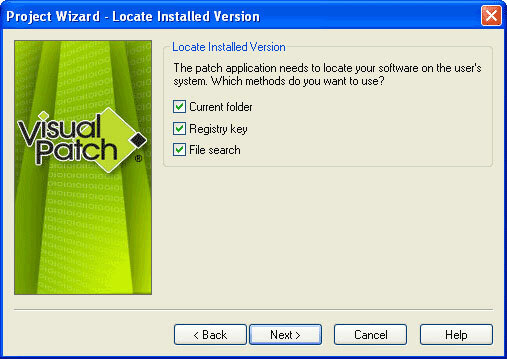 Unlike a full software installer, patch files contain only the data needed to update older versions – making them ideal for public website distribution. Data security and integrity is ensured through a combination of 128-bit MD5 hashing, CRC-32 checksums and encryption standards. A powerful scripting engine with more than 250 high-level actions gives unprecedented control over the software patching system. Features everything from registry editing to web script interaction, file downloads and more. A library of over twenty different screens (plus graphical skinning system) makes it easy to control the user interface of your patches. There are pre-built layouts to handle just about any task you can imagine, and it’s easy to adjust them to fit your needs exactly. A unique language selector is included on each screen dialog, making it easy to create multilingual user interfaces and modify translations at will. 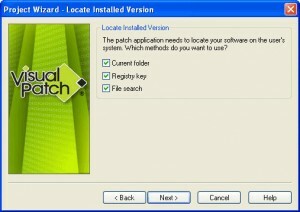 Supports the creation of both fully-interactive “wizard based” patches or completely automatic patches that operate silently without displaying any user interface at all. Advanced system-changing capabilities are built right in. Query the Registry, modify INI files, perform file searches, interact with web scripts, explore folders, delete and rename files, and more. Codesign your patches with integrated support for Authenticode certificates signing. Visual Patch fits seamlessly into your automated build processes with features like build constants and pre/post build processes. Improved HTML-based project reports and text-based install-time log files give you an accurate record of your patch. New options let you control the level of detail being logged, including options for recording errors and script execution details. Choose from dozens of pre-made themes (skins) for your dialogs or make your own. It’s as easy as viewing a live dialog preview and picking your favorite style. Configure everything from fonts and banner images to body/background graphics, control colors and more. Visual Patch is an integral component of Indigo Rose’s software deployment suite. For a complete and fully integrated end-to-end solution, we’d recommend using Visual Patch in conjunction with Setup Factory (software installation) and TrueUpdate (automated “check-for-update” feature). Creates self-extracting executable patches that are compact, optimized, and completely self-contained, with no external dependencies or extras to distribute. Make a single patch file that is compatible with all popular Windows systems, including Windows 10, Windows 8.1, Windows 8, Windows 7, Windows Vista, Windows XP, Windows Server, Windows 2000, Windows ME, Windows 98 and even Windows 95. The software ships with an extensive command reference help file and a 285-page user’s guide in PDF format. Indigo Rose stands behind its products with a refreshingly personal approach to technical support. We’ll treat you like the valued customer that you are. Indigo Rose Software products are trusted by tens of thousands of software developers worldwide where our runtimes ultimately reach millions of desktops.